Have you heard of our Flex Training Table system? This adaptable system allows you to effortlessly reconfigure a room from straight and round training tables to race-track, horseshoe, and d-shaped collaborative environments. Sue Emerson, Territory Manager for Alaska, Colorado, Hawaii, Idaho, Montana, Oregon, Washington, and Wyoming, has found this system of tables instrumental in creating active learning and training environments for her customers. 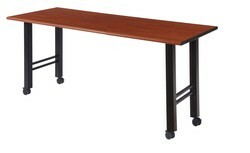 Q: What markets do you typically sell Flex Training Tables to? A: Most of mine have been for Higher Ed and/or general classroom use. Q: What kinds of spaces are they being used in? A: Generally these are for classrooms. One project was a small K-12 library where they put them around the perimeter of the room to use with desktop computers. Any new requests I’ve received have been for collaboration. They like the idea of being able to move the desks around, like 2 rectangular with a ½ round which can be used to break apart in small groups or put together as a d-shape collaborative space. Q: What are your customers saying about the Flex Training Tables? A: They like that they are very durable and mobile. The tables can be ordered with 2 or 4 casters so that rooms can be rearranged easily and quickly. They like the flexibility of being able to move them around the room. The cost is also attractive. Q: What features do they have that customers are attracted to? 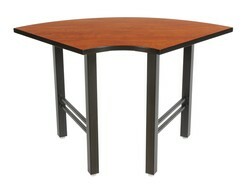 A: Cost (as stated above), but also the different sizes available. 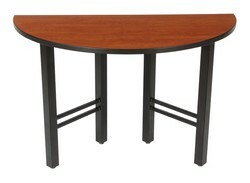 There are different widths and lengths along with round table options to meet the configuration they need. 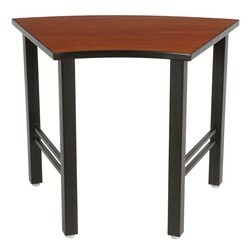 Q: Why would customers choose this style table over another option? A: Loyal customers know they are durable products. They also can add on different sizes and options as needed. Discover more features of the Flex Training Table system and request a quote today!